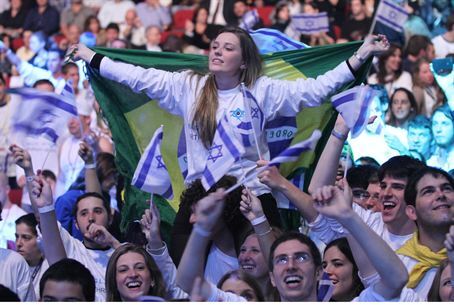 PM Binyamin Netanyahu announced a sharp increase in the budget for Taglit (Birthright), with a goal of enrolling 50,000 participants each year. Prime Minister Binyamin Netanyahu last week announced a sharp increase in the budget for Taglit (Birthright Israel), the program that provides Jewish college students from the U.S. and other countries with their first Israel experience. As Taglit enters its second decade, the government will provide NIS 90 million for the program in 2013, with further increases to NIS 120 million and NIS 140 million in the following two years. During its first 10 years of existence, the government spent about NIS 100 million altogether on Taglit. Donors who have supported the program until now – including Charles Bronfman, Michael Steinhardt, and Dr. Miriam and Sheldon Adelson, have pledged to continue supporting Taglit, in order to enable as many students as possible to join the program. As a result of the increase in aid, Taglit will have enough money within three years to bring 51,000 college students to Israel each year, for a free or highly subsidized trip to get to know their ancestral homeland. Officials said that with the budget increase, Talglit could have enough money each year to bring half of college-age Jewish students to Israel for the 10-day tour, which includes touring ancient sites, meeting college students in Israel, and learning about Israeli life and culture. Over the past 10 years, over a quarter million students have been on Taglit tours. Netanyahu announced the increased funding during a speech at the Binyanei Ha'umah Convention Center in Jerusalem last week. Speaking before thousands of young adults from around the world, Netanyahu said that he had been privileged to be the first Prime Minister to support Taglit, when he led the country in the 1990s. “What was then a daring idea has now been shown to be a great success. Taglit is the main bridge for thousands of Jewish youths from around the world to get to know Israel, strengthening their connection to Israel and the Jewish people,” Netanyahu said. “Every Jewish youth who wants to visit Israel should be able to do so, and increasing Taglit's budget is a historic decision and a strategic asset for the strengthening of Israel's position in the world. I see the hundreds of thousands of Taglit participants as an 'army of ambassadors' that will present the truth and the facts on life in Israel to others on their campuses and in their communities,” Netanyahu added. Gidi Mark, Taglit's CEO, said that the project, which started as a vision in the minds of donors, philanthropists, and Israeli government officials, has turned into a reality, and is a greater success than anyone dared imagine. “We believe that in its second decade, Taglit will have a major impact on strengthening the Jewish people and its connection to Israel,” he said.